Billing: Information about adjusting your plan or canceling your account. Information about adjusting your plan or canceling your account. 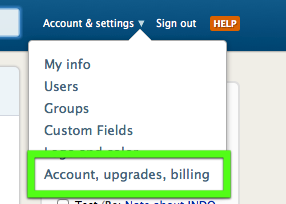 The account owner is the only person who can upgrade, downgrade, or cancel the account. Changing your plan is easy. Just click on the “Account” tab on the Dashboard and you’ll see your options in the chart near the top of the page. You can upgrade from any level to any level at any time. In order to preserve your projects, you can only downgrade to a level that can handle your current active project count. For example, if you currently have 20 active projects you can’t downgrade to the Basic plan because the Basic plan only allows 15 projects. You’ll have to delete or archive 5 projects before you can downgrade to Basic. Upgrades and downgrades take effect immediately. The new monthly rate begins at the start of your next billing cycle. It’s simple. Click the Account link at the top of any screen. You’ll see the upgrade options. To get more pages, file storage, or other features, select a higher plan. The account owner can click the Account link at the top of any screen. You’ll see the up/downgrade options there. Upgrades take effect immediately. You can also downgrade from this same area. The account owner can go to the Account page from any of the applications following the instructions above. There, s/he will see the option to up- or downgrade. 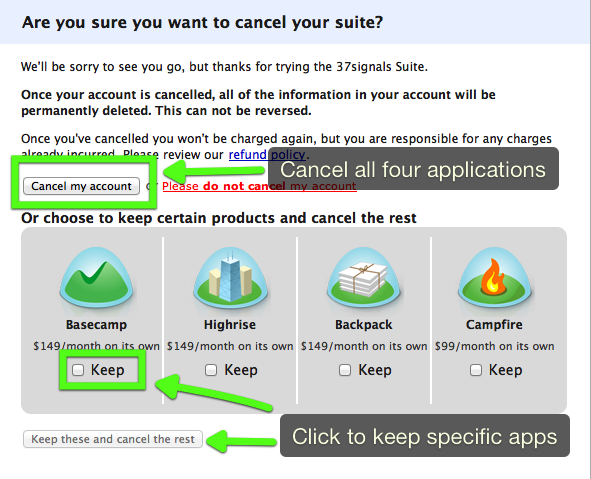 Then, you’ll see the option to cancel all four applications (Basecamp, Highrise, Backpack, and Campfire) or select specific applications to keep.